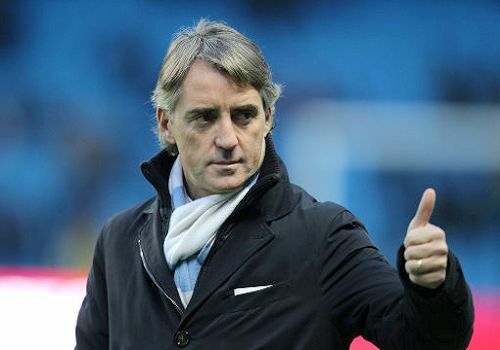 Roberto Mancini is now famous because he brought the title, after 44 years, for Manchester City, as a manager. And before training in England he made a solid name by winning with Inter Milan seven internal trophies in Italy, between 2004 and 2008. But Mancini was also a famous footballer, even though many remember him as a very inefficient striker for the national football team. 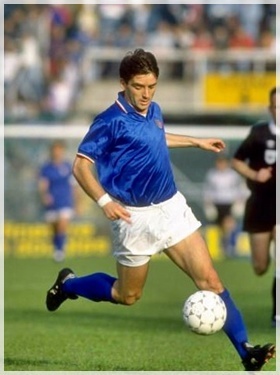 From 1984 to 1994 he appeared in 36 matches of Italy, thing which didn’t help him too much, as he only scored four goals! Nothing unusual, you say? Well, you have to consider that he played as a striker! Long time passed even until his first achievement, four years to be precise, because it came in 1988. But what a goal that was! On 10th of June 1988, at Dusseldorf, the European Championship was starting and the hosts, RFG, were confronting Italy. The hosts open the score in the 52nd minute, thanks to Mancini. His goal came only three minutes before Brehme’s. It ended 1-1 and at the final, both squads progressed into the semifinals, with five points each. But nobody qualified further. Italy was eliminated by SSSR and so the Cup dreams were over. The striker with only one goal hit again in the qualifying campaign for the World Cup 1994. Three goals, against Malta and Estonia don’t seem very important, but that campaign was the start for Italy on the road for the trophy, which they would eventually lose, against Brazil, at shootout. 1994 was also the year in which Mancini signed his last appearance for the national team. A modest international career, marked only by a few goals, but this isn’t the only Mancini. I mean, the ‘other Mancini’ is the man that made history at club level. Never mind as a coach, but as a player! 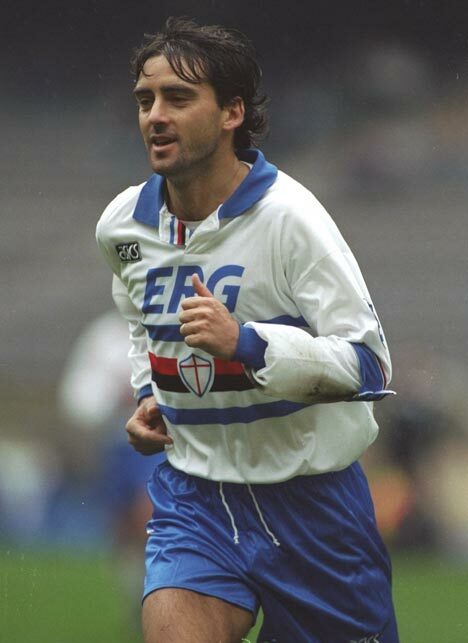 Roberto played at Sampdoria from 1982 to 1997. After a starter season at Bologna, he signed with the Genovese team and never left it for 15 years! 566 matches and 168 goals could have been nothing if we consider that he won with Sampdoria seven titles. In fact we can say he caught all the trophies that Doria ever won: one league title (1991), four cups (1985, 1988, 1989, 1994), one Italian Super Cup (1991) and one Cup Winners’ Cup (1990)! Also, he played in the only European Champions’ Cup final in which the Genovese ever appeared: in 1992. 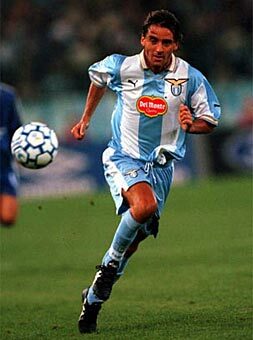 After 1994, for three years, nothing else happen at the club, but his personal performances were very good as Lazio decided to buy him in 1997. Born 27th of November 1964, Mancini was nearly 33 by then and he looked unconvincing for a squad that was very near the top. Despite all this, he played here three seasons, in 136 games and scored only 24 pieces. But he won another bunch of trophies: six! Another Italian title (2000), again the Italian Cup (1998, 2000), a new Italian Super Cup (1998) and one more UEFA Cup Winners Cup (1999), but it wasn’t all, because he got also a bonus: the UEFA Super cup, in the same 1999. After, it come a transfer to England, at Leicester City. He lasted here only a few weeks, in which he entered in four games. And all because Bologna made him an offer to start his coaching career, that he didn’t want to refuse. This career started hesitating, but increased surprisingly well at Inter and reached its maturity at Manchester City. Even though he played a very short while in England he had the time to fell in love with British football and so the contract with the ‘Citizens’ came as a real treasure. Acest articol a fost publicat în Campioni și etichetat 1964, 1988, 1990, 1991, 1999, 2000, 36 matches, 4 goals, Bologna, Cup Winners' Cup, EURO 1988, Italian Cup, Italy, Lazio Roma, Leicester City, Manchester City, Roberto Mancini, Sampdoria Genoa, Serie A. Pune un semn de carte cu legătura permanentă.